Edited by Weibo Cai and Hao Hong . Proteins are indispensable players in virtually all biological events. The functions of proteins are coordinated through intricate regulatory networks of transient proteinprotein interactions (PPIs). To predict and/or study PPIs, a wide variety of techniques have been developed over the last several decades. Many in vitro and in vivo assays have been implemented to explore the mechanism of these ubiquitous interactions. 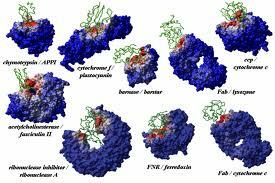 However, despite significant advances in these experimental approaches, many limitations exist such as false-positives/false-negatives, difficulty in obtaining crystal structures of proteins, challenges in the detection of transient PPI, among others. To overcome these limitations, many computational approaches have been developed which are becoming increasingly widely used to facilitate the investigation of PPIs. To provide a centralized resource for scientists who are either new to or working in the area of PPIs, we have organized this book. An international ensemble of experts in the field were invited to contribute a total of 22 chapters, which have been broadly categorized into Computational Approaches, Experimental Approaches, and Others. The section of “Computational Approaches” contains 14 chapters. In the first chapter, Dr. Porollo and Dr. Meller gave an excellent review of the computational methods for the prediction of protein interaction sites, which were mainly focused on structurebased approaches. Next, an international team of experts from France, United Kingdom, and USA summarized the recent advances that are related to interactive molecular simulation approaches. Simulation design, software architectures, and applications in protein-protein docking were all discussed in exquisite detail. The following chapter, written by Jung et al. from the Republic of Korea, reviewed the PPI data available through public databases. Both non-network-based and network-based approaches were discussed, along with computational prediction methods of protein subcellular localization by exploiting the PPI data. Dr. Lubovac-Pilav from Sweden focused on defining the similarity between protein interactions based on an integrated score. The SWEMODE (Semantic WEights for MODule Elucidation) algorithm was discussed in detail in this chapter. Next, Dr. Wang from Hong Kong, China introduced the use of quasi-bicliques for finding interacting protein group pairs and proposed approximation and heuristic algorithms for finding large quasi-bicliques in PPI networks. In the following chapter, Fujiki et al. from Japan focused on the interactions among three proteins. The combinatorial effect level, which emerges only when those three proteins gather, was derived and estimated in a fully statistical manner. Dr. Hirose provided an excellent review on PPI prediction by computational techniques. The concepts and applications of several methods for inferring PPIs were covered, along with the databases and prediction methods that deal with protein flexibility, as well as the possibility of inferring PPIs from protein dynamics. Prof. Xing and co-workers presented a unified mathematical formalism describing both conformational change and chemical reactions of proteins. The implications of slow conformational changes in protein allostery and network dynamics were also discussed in this chapter. Next, Prof. Huang and colleagues reviewed the methods for prediction of PPI sites using mimotope analysis. The current status, as well as the challenges and future directions of the field, were summarized. Prof. Oliva from Spain covered the strategies for modeling the interaction between two proteins from sequence data and reviewed the existing techniques to model large cellular protein complexes. In the next chapter, Dr. Chang focused on the concept of co-occurrence pattern and implementation details of methods in PPI prediction based on this concept. Sakhteman et al. from Iran gave an overview on the biochemistry details of G-Protein coupled receptors (GPCRs) and provided information on homology modeling and molecular dynamic simulation methods for studying interactions involving GRPRs. Next, Dr. Iacucci and Dr. Moreau from Belgium evaluated the application of least square support vector machines (LS-SVM) to receptor-ligand interaction prediction and discussed various other methods to study PPIs, most of which relying on the phylogenetic profile analysis of candidate interactors. In the last chapter of this section, Ravaee et al. from Iran introduced the fuzzy learning vector quantization (FLVQ) as a high tolerant method for clustering PPI network to find protein complexes, which is less vulnerable to false-negative and false-positive interactions in PPI data than other techniques. Although computational simulation is a powerful tool for studying PPIs, novel experimental approaches for investigating PPIs that can overcome the limitations of existing techniques are continuously been developed. Such techniques represent a vibrant area of research on PPIs. In the section of “Experimental Approaches”, the current state-of-the-art experimental strategies to study PPIs are presented in four chapters. Molecular imaging, an extremely powerful tool to study molecular events in living subjects, can provide invaluable information and insight in elucidating the process of various PPIs. In the first chapter of this section, we summarized the current status of in vivo imaging of PPIs with various techniques, including fluorescence, bioluminescence, and positron emission tomography imaging. Next, Dr. Mohan illustrated the theoretical aspects of non-linear behavior of amide proton chemical shifts. In this chapter, he demonstrated the residue level nuclear magnetic resonance (NMR) description of the low energy excited states representing locally different alternative conformations in different complex protein systems. Mendoza-Espinosa et al. described the physics and chemistry behind the disorder-to-order transitions in proteins and introduced different experimental measures to study the structure and function of multiple types of apolipoproteins. The last chapter of this section, contributed by Dr. Zhang, focused on the specific modulation of electrostatic interactions between proteins by salt. The third section of this book contains four chapters that do not readily fall into either of the abovementioned categories. In the first chapter of this section, Prof. Fernandez- Fuentes and colleagues presented the theoretical basis of computational tools designed to predict PPIs, and then focused on the computational methods developed to predict protein interfaces. Dr. Hase and Dr. Niimura summarized the current knowledge of the statistical properties of PPI networks. They also reviewed the studies related to drug discovery and the possibilities of medical studies as an integration of network and evolutionary biology. The next chapter written by Dr. Jancura and Dr. Marchiori gave a general overview of the relevant literature and advances in the analysis and application of evolution in PPI networks. Lastly, Otasek et al. described pathwaycentric analysis and the analysis of networks generated from protein-target interactions, which can elucidate the role of these proteins. The research field of PPIs is highly dynamic and constantly evolving. We are truly grateful to the exceptional team of authors for their tremendous effort, all of whom have many responsibilities and yet they spent countless hours in these 22 chapters to make this book possible. With such whole-hearted support and participation from international experts/leaders of the field, we are confident that this endeavor will serve as a comprehensive reference book and help moving the field forward.